Muscat - often referred to as the "walled city", Muscat proper is the site of the royal palaces. Matrah (Matruh) - originally a fishing village, and home to the maze-like Matrah Souq. Ruwi - generally considered the commercial and diplomatic centre of the city. This tripartite division will sometimes cause the visitor an inconvenience, as distances between sites can be very long. As an alternative to the main CBD area that is considered as these three areas there is plently of places to go and things to see along the main highway that heads North East out of these areas. This main road, The Sultan Qaboos Highway, goes past many areas on its way out to the Airport and further still to Seeb, Sohar and eventually the northern most tip of Oman. Heading along this road you pass the districts of Qurum, Madinat Al Sultan Qaboos, Al Khuwair, Bausher, Al-Hail and Seeb. Each one has a range of sights to see and places to stay. There is also a very long beach road from Qurum to Seeb, some 50km. Situated along this are some of the large international hotel chains but more importantly you discover the true beauty of the Oman coast-line. Km's of beaches, fisherman with drag nets and open space to walk for hours. The climate is tropical, with very hot and generally humid weather year-round. Visas upon arrival for eligible countries are quick and easy to obtain cost 20 OR for a 30 day validity. 10-day visas are now (2018 July) available again, it cost 5 OR. Always check the length of visa granted: people have reported being incorrectly granted a 10 day visa at land border crossing and inadvertently overstaying their visas. Penalties for overstaying visas are extremely high: 10 OR per person per day, payable at the border where you entered Oman. Numerous air services arrive to Muscat International Airport, located only 15 - 20 minutes from the city (depending which part of Muscat you are staying). Taxis are abundant and generally use meters. Thai AirAsia X  operates 3 flights per week from Muscat direct to Bangkok (Don Mueang). Departing Tuesday, Thursday, and Saturday beginning June 28, 2016.
flydubai  operates 4 flights per day from Dubai to Muscat. Oman Air  operates flights to Muscat from Abu Dhabi, Al Ain, Amman, Bahrain, Bangalore, Bangkok, Beirut, Cairo, Chennai, Chittagong, Dar Es Salaam, Delhi, Doha, Dubai, Frankfurt, Hyderabad, Islamabad, Jaipur, Jeddah, Karachi, Kathmandu, Khasab, Kochi, Kozhikode, Kuala Lumpur, Kuwait, Lahore, London Heathrow, Lucknow, Male, Manchester, Milan, Mumbai, Munich, Paris, Ras Al Khaimah, Riyadh, Salalah, Singapore, Tehran and Thiruvananthapuram. Gulf Air  offers flights from Bahrain to Muscat (BHD 75.900 return, Sept 2010). Emirates  has 7 flights per day from Dubai to Muscat, flying time 1 hr. (from AED 650 return, Jan 2013). Air Arabia  offers 2 flights per day from Sharjah to Muscat, duration of flight 55 min (from AED 295,000 return, Sept 2010). Britsh Airways  offers daily flights from London Heathrow to Muscat (from GBP 455 return, July 2014). The journey has a 1-hour stop-over in Abu Dhabi during which passengers stay on the plane. KLM  operates flights from Amsterdam to Muscat on Mon, Wed, Thu, Fri and Sun, duration of flight 8hrs 30min. Lufthansa  has flights from Frankfurt to Muscat from Sun to Fri, duration of flight 8 hrs (from EUR 796,- return, Sept 2010). Swiss  operates daily flights from Zurich to Muscat via Dubai (from CHF 774,- return, Sept 2010). Air India Express  has flights to Muscat from Amritsar on Wed and Fri (duration of flight 3 hrs 15min, from Delhi on Wed and Fri (duration of flight 5 hrs 20min), from Kochi on Tue, Thu and Sun (duration of flight 3hrs 35min), from Kozhikode on Fri, Sat, Sun (duration of flight 3hrs 25min), from Thiruvanantahapuram on Tue, Thu to Sun (duration of flight 3hrs 45 min, or 5hrs 20min if flight goes via Cochin). Pakistan International Airlines  operates flights to Muscat from Islamabad on Mon, Wed, Thu, Sat and Sun and from Peshawar on Wed, Thu and Sat. Turkish Airlines  operates flights to Muscat from Istanbul on everyday. The number of airlines flying to Muscat increases each year, although the Omani sale of their part of Gulf Air has meant a temporary decrease in passengers. Domestically, Oman Air also flies from Salalah to Muscat at least twice weekly. Oman National Transport Company  runs busses to Muscat from Dubai (duration of journey: 6 hrs) and Abu Dhabi (via Buraimi). al-Khanjry Transport runs a bus from al-Rigga in Dubai to Muscat, leaving every day at 7:00am and 3:00pm (55 dirhams one way, 90 return). Within Oman there are daily busses to Muscat from Buraimi (via Sohar), Nizwa (2hrs 20min), Salalah (13 hrs, reservation required), Sanaw and Sur (4hrs 15 min). Long distance busses arrive at the Oman National Transport Company at Ruwi, Al-Jaame Street (near Sultan Qaboos Mosque). Scheduled departures with ONTC from Ruwi included: Ibri (08:00, 14:30), Sur (07:30, 14:30), Burimi (06:30, 13:00, 16:00), Salalah (07:00, 10:00, 18:00), Dubai (06:00, 15:00, 23:00). More departures (particularly to Salalah) are available through the Gulf Transport Company (GTC). You can reach Muscat by road from the United Arab Emirates. The journey takes about 5h by crossing the border in Hatta/Al Ain. You can drive from Al Ghaydah in Yemen.naimu The journey is about 6 hours via the border crossing at Sarfeit to Salalah and then another 10 to Muscat. Maxi taxis (vans, known throughout the expat community as baisa busses) ply the highway from Seeb to the corniche area. The charge is 100 baisa from corniche area to the church round about and another 100 baisa from the church round about to Wadi Adai. On arrival at the airport, situated approximately 40km from the main Muscat CBD, you can get a baisa bus down the main highway in either direction. The (mostly orange and white) taxis are a bit pricier, and they hang around the hotels where they get juicy fares from unwary travellers. They will charge 8 Rials for an airport trip if you don't haggle, but you should be able to barter for 5 Rials. They always say they will give you "good price" but its best to figure out what you want to spend then agree before you get in. The Maxi Taxis ply the main routes through town, and they go where they want so you might have to find one going your direction, once you are on one, they will make sure you get there. THe place to wait for them is on the on-ramps of most of the main highway junctions, you'll usually see a few people waiting around for one. A journey within the Muscat area should not cost more than 300 Baisa each, but if you look like an experienced traveller and hand them 200 baisa then you can usually get away with that. There are many rent-a-car services available in the city. There is much conflicting information as to whether an international driving licence is required for renting out a car. According to the Royal Omani Police website, a valid license from your home country is sufficient for up to 90 days. It is best to verify this with the rental company. Most of the Car Rentals have offices at the airport arrivals terminal. The cheapest car hire is about 11 OMR (14 GBP) for a day which will get you an economy car with manual transmission and sometimes no air-conditioning. To get yourself properly equipped, you should hire a 4WD which will be around 30 OMR (38 GBP). Make sure that you will get a proper induction on driving in Oman. Road signs in Muscat can be quite confusing, particularly when having to decide which exit to take to reach your destination. Best to ask a local to provide you with directions if you haven't been to your destination previously. Al Jalali Fort and Al Mirani fort They are located in Qasr Al Alam Street. The forts were built as prisons in the rocky mountains in 1580 during the Portugese occupation, and have now been converted into museums. Update as of August 2012, the forts are now closed to the public. However, outside photography is allowed. Qasr Al Alam Royal Palace Guarded by the twin forts of Jalali and Mirani, this is the office of Sultan Qaboos, the ruler of Oman. This beautiful palace stands on the head of a natural deep water harbour. Visitors are not allowed to visit the palace, but they are allowed to take photographs at the entrance of the palace. Corniche Area The recently renovated Corniche area is a popular place for a walk and also for its many eating places. Climb to the base of Mutrah Fort (at the east end of the Corniche walk) for a spectacular view of the city. Sultan Qaboos Grand Mosque. This is the third largest mosque in the world and mostly the entire complex is open to non-Muslim visitors. Non-Muslims may visit from 8AM to 11AM every day except Friday. Ladies are however expected to keep their heads, ankles and wrists covered while visiting the mosque. Must sees in the mosque include the Swarovski crystal chandelier, the second largest hand made persian carpet in the world and the marble panelling. A number of factories are open for visitors such as the Omani halwah factory and the Amouage perfume factory. Amouage perfume is the most valuable perfume in the world. Nakhal Fort. This splendid fort is about 40 minutes drive east of the city, located at the base of the Jebel Akhdar section of the Hajar Mountains. Marine Science & Fisheries Centre, between the Al Bustan Palace Hotel and the Capital Yacht Club. National Museum, near Abdulridha Mosque-Ruwi. Omani French Museum, Near muscat police stn, Located at old Muscat in Bait Fransa. Omani Museum, Medinat Al Alam (Information City) near Ministry of Information. The Sultan's Armed Forces Museum, Bait al falaj. Al Mutrah walking tour: Walk down the waterfront in the Corniche area to catch a cool sea breeze, and treat yourself to some sandwiches and Halib (tea with milk) or Sulaimani (black tea) at one of the wayside restaurants. A cup of tea costs about 1 rial. From the waterfront enter the Mutrah Souk and bargain for Arab hand-embroidered mussar (shawls intended to be worn as turbans, which cost 10 rials and above), garments, nuts, spices, incense, earthen ware, etc. Before getting back to your hotel have dinner at one of the wayside restaurants on the waterfront. If you start in the morning, commence your tour at the fish market in the port area and stroll easterly towards the fort. Scuba Diving: visit the Oman Dive Centre at Bandar Jissah. Mutrah Souk The maze-like souq (marketplace), which also includes a fish market, is often described as the best in the Gulf region. The souq has several shops for jewellery, traditional Omani handicrafts and Omani food at reasonable prices. It is also a great place to find fun gifts to bring home . Several shops accept credit cards. Sabco Centre, Qurm. Located near the turnoff between Sultan Qaboos St and Qurm Heights Road, the "Sabco Centre" is actually a collection of about half a dozen medium sized shopping centres which is very popular with locals. The actual Sabco Centre has a small souq-like collection of shops that contains many of the handicrafts that are available in the Mutrah Souq. Opposite the Sabco Centre is the Omani Craftsman's House that only sells guaranteed Made in Oman crafts at fixed (but relatively high) prices. Oman Avenues Mall.Oman Avenues Mall is a division of renowned LuLu Group International. Oman Avenues Mall offers an all-in-one shopping, dining, kid zones and entertainment experience to locals and international tourists. .
Muscat City Centre, Seeb, . Currently the biggest mall, containing a lot of shops including a large Carrefour . Qurum City Centre.Recently opened up at Qurum and contains Carrefour too . Godiva Chocolates, Sabco Centre, Ruwi, Tel - 562367. Lulu Hypermarket, Darsait, Bausher and Seeb tel - 7711449. Safeer Hyper Market, Athaiba (Azaiba), Tel - 502461. Select, All Shell Petrol Bunks. Sultan Centre, , Tel - 567666. The Al Fair chain of supermarkets sells just about everything you want. Many of them are on the main Sultan Qaboos highway making them an easy place to spot. There are numerous Indian run tailors. You may pay RO 5 to have 2 Italian suits tailored for sleeve length, trouser length and waist. There is a Raymond store in Ruwi that will make custom suits in the RO 50-500 range, depending on quality. In fact they have excellent fabrics from pure wool to wool blended with exotic fibers like Cashmere, Mohair or Angora and linen. Even Super 230s crafted out of 11.8 micron wool are found there. Ask them for their catalogue - you will find the latest Italian designs and styles in there and a really good suit can be really light on the pocket. Be aware that a custom suit will take up to 2 weeks to finish, therefore there is no use going to this store if you are staying for vacation for just one week. Food can be cheap in Muscat and for about 1-3 Rials you'll get a meal per person, depending on where you eat. Al-exandria, Fanja House, Near Sabco Centre, Ruwi, Tel - 561611. The best Rotis (Indian Bread). Try the chicken Jalfrezi and Paneer aloo (potato). Automatic, (Cuisine - Lebanese). Try the Hummus (Chickpea paste), Fatoosh (Salad), Mutabel (Egg Plant paste), Falafel and mint tea. Even the waiters are not sure why the restaurant is named automatic. There is a branch of Automatic located on the side of the Sabco Centre facing away from the central car park. There are also branches in Ruwi, Al Khuwair and elsewhere in Muscat. Al-Haikal, Near Bus Stand, Ruwi (Cuisine - Pakistani). Al-Hanan, Ruwi (Cuisine - Indian). Al-Shaheen, Honda Road, Ruwi (Cuisine - Pakistani). Al-Tarboosh, opposite the Sabco Centre, Qurm. Fast Arabian/Lebanese-style food available for takeaway or eat-in on the first floor. Saravana Bhavan, Opp. O.C Centre, Ruwi (Cuisine - Indian). Bella-Pais, MAM roundabout, just off the Nizwa turn off (Cuisine - Greek + Other). Gujrat Bhojan Shala, Ruwi High Street, Ruwi (Cuisine - Indian). Oman Express, Tel - 7731329. Delivers Lunch - 18 rials for a month including Fridays or 15.6 Rials excluding Fridays. Subway, City Centre, Seeb, Tel - 542225. Many restaurants targeting Indian guest workers in Al Khuwayr; also, Ofair and Ibn Ateeq Omani restaurants. The ubiquitous coffee shops, for more info see the main article on Oman. Chedi Hotel pizza restaurant offers less expensive food than the other Chedi outlets, with the same understated chic ambience. Kargeen, located in Madinat Qaboos, offers a good range of local food and from the wider region such as Lebanese dishes. Their fresh juices are a must, or even a fruity shisha pipe. The main plus is the ambience; most of the restaurant is outdoor seating with a "ceiling" of lights. "Chili's" a few in central Muscat, good fast food. "Left bank" one of only two places in Muscat where you can eat and enjoy a beer or a glass of wine. Great setting on top of a hill. Non smokers sit in side, as many of the wannabe's and smokers sit outside. Food is good. Al Khiran, Al Bustan Palace Hotel, (Cuisine - Buffet). Famous for their Friday brunch buffets which cost RO 19.500 per person + 17% service charge/tax. Chedi Hotel, On the coast road (Cuisine - 4 open kitchens from across the world). Mumtaz Mahal, (Cuisine - Indian). Passage to India, PO Box 385, Jibroo, Wadi Adai, Hatat House Compound, Tel - 568480 (Cuisine - Indian). Samarkhand, Oasis by the Sea, (Cuisine - Indian Peshwari). Every road, street corner or little collection houses, huts or businesses has a 'Coffee-Shop' Basic but worth a go. Fresh fruit juices are delicious and available from a number of stalls and cafes in Muscat. Some well-known ones are Fast Food 'n' Juice Centre on the Corniche at Mutrah (where you can watch the world go by from the outside tables) and Al Ahli Coffeeshop inside the Mutrah Souq. Expect to pay between RO 0.500 and 1.500 for these juices depending on type and size. There is a Starbucks located on the beach road that goes between the Crown Plaza Hotel and the Intercontinental Hotel. It is so close that if you cross the road, you are on the beach. The larger drinks are about RO 2-2.2, but the view through the glass wall of the waves coming into the beach is excellent. Motif Coffee Shop. Next to the Intercontinental Hotel directly on the beach where you can sit under palms and watch the sunset. Despite the location prices are moderate. Fresh juices are RO 1.1, a tea or coffee RO 0.8, a sandwhich about RO 1 and grilled fish or squid RO 3. It is a great place. Delmon Hotel Apartments. Spacious, clean, and close to a LuLu's Hypermarket. For about 20-25 Rial a night ($55 US) you have a fridge, a coffee & tea maker, and a modern bathroom. Free wifi in rooms and lobby. Golden Oasis Hotel . In the centre of Muscat and close to the main commercial area. A popular choice for tourists. Hotel Summersands . Hotel Summersands is located in Seeb,Muscat, just 13 Km from Muscat International Airport. The hotel was built according to the Best Western international standards. At the present time the hotel has 37 high-class rooms equipped according to modern standards. Guest Houses. There are a number of Guest Houses (Isteraha in Arabic) spread around Muscat which are quite affordable and acceptable in general. The Crown Plaza . Located in Qurum with a grand view north up the beach towards the Intercontinental. Al Bustan Palace Hotel, ☎ 799666, . edit Built originally to house a regional conference in the mid-80s, the hotel is famous for its brunches. Worth visiting just to check out the lobby and hotel grounds. The Chedi Muscat. Five star luxury with traditional Omani architecture. Grand Hyatt. An opulent building built in what is almost a parody of Arabian palace styles. There is a great pool facing the beach, but this costs 10R ((£17) for the day and drinks are very expensive. There is a bar inside the pool also, in which people are allowed to smoke. Ruwi Hotel, . A tired and run down hotel that is more the standard of a third world back packer establishment. Interesting bar tho. Shangri-La Hotel, . Part of the international luxury chain. In Bar al Jissah, which is about 30 minutes past downtown Muscat. The hotel can be challenging to find, so make sure you have a good map if you are driving. The Shangri-La is on a beautiful section of the coastline. It is advisable to drink bottled water while in Muscat. Oman Oasis, Tanuf, Arwa, Salsabeel, and Aquafina are the most recognisable brands of mineral water and is available in most convenience shops. "Masafi" and "Darbat" are also brands at reasonable rates - RO 1 for 12*1.5 lts. Tap water is generally not safe so use bottled water. Global calling card 'Global One' does not work in Muscat. Though the global one website lists the rates for calls from Oman there are no numbers listed along side. The nearest 'Global One' help line is in Dubai. Pre-paid telephone cards called Jibreen Cards are available at most stores. It's available in denominations of 5 Rials and 1.5 Rials. A 5 Rial card gets you 11 minutes of talk time. A good prepaid SIM card for cell phones is Omantel’s Hayyak. It’s available at the typical corner phone shops and costs about 1–2 RO, with an equivalent amount of credit inside (dial *100# to see your remaining balance). You’ll need your passport to register the line. SMS to Europe are 50 Baisa, and there is a number of internet packages available; for example if you have 3 RO of credit, you can get 1GB – to be used up within 7 days – by dialling *141*7#. You can check your remaining balance of that package by dialling *141*7*0# (and similarly for the other packages). One can book multiple different packages simultaneously. A list of available packages can be obtained by sending 141 to the number 90000 (free). Note: It appears that Android devices cannot be configured remotely by the provider for internet access; instead, you can try to call the toll-free hotline (Nr. : 1234), or do it yourself: Go to the Mobile Networks Settings, create a new AP (Access Point) and select it for use: User name, password and APN (Access Point Name) must be set to taif. ATMs are very common now, especially in the Embassy district and near most shopping malls, larger hotels, petrol stations and supermarkets. Also, every little neighbourhood has a several bank branches. Bank Muscat is by far the largest bank in Oman and one of the largest in Gulf. It has over 230 ATMs all around Muscat. There are some very good gymnasiums in the 4 to 5 star hotels and some privately run gyms in other places like Millennium Gym, Horizon Gym etc. You may pay money for that extra with the number of days you stay in Muscat. If you are in a 4 star hotel, they will charge a lot for laundry. If you take a short walk to any of the numerous Indian run laundry stores, your money will go a lot farther. Keep in mind that if you drop off your clothes on a Monday, they typically won't be ready until Wednesday. Oman Today - a small glossy magazine with tips on tourism, local trips and eating-out. It is published monthly. A number of many Indian and Gulf newspapers are also available. Salalah - the jewel of southern Oman, with incredible beaches and plantations. 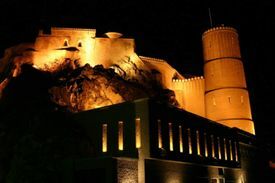 Nizwa - nice drive through the Hajar Mountains to this scenic town, or stay in Nizwa and explore the mountains and forts. Good base for the trip to Jebel Shams and many other historical sites, caves and walks. 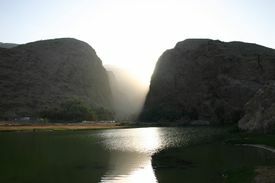 Wadi Shab. This is perhaps the most spectacular of all the easily accessible wadis in Oman. It is located about 100 km southeast of Muscat, accessed from the main coastal road to Sur at the village of Tiwi. The pools here are a vivid emerald green colour, and the caves and sheer sides of the wadi are quite dramatic. The car park under the highway is the starting point for the short boat ride (1 OR per person) across the wadi, and thereafter it is a 45-60 minute walk to the pools. Rock scrambling required, be careful as many people have fallen while taking photos. Past the third pool there is a narrow underwater passage to an amazing waterfall. Wear clothes you can swim in (women can wear bikinis and shirts) and sturdy shoes, but leave your belongings in the car. This page was last edited on 2 February 2019, at 04:03.